Reducing cigarette smoking through health graphics and standardised packaging – will it work? Towards the end of 2012 the Australian government introduced new rules which stipulate that all cigarettes should be packaged in brown packets with large graphics and only a small area for the brand name which needs to be presented in standardized text. Wakefield and colleagues recently published a paper in the BMJ evaluating the effects of the introduction of plain packaging on smokers' attitudes and intentions to quit. 4004 people were randomly contacted by telephone and from that sample they identified 572 smokers who participated in the study. Of those 72.3 % used plain packet cigarettes and 27.7% used the old branded packets. Wakefield and his colleagues found that when compared with people who smoked from branded packets, plain packet smokers were twice as likely to report that they had thought about quitting and they rated quitting as a higher priority in their life; however, there was no difference in intention to quit between the two groups. Sheeran and Webb (2002) completed a large meta-analysis on behaviour intentions and behaviour change and found that even a medium to large change in intention only leads to a small to medium change in behaviours. So, given we have seen no difference in intention to change among plain packaging smokers, will we see a change in smoking-related behaviours? It is very early days so further research will be needed to answer this question. Interestingly, plain packet smokers perceived their cigarettes to be of lower quality and less satisfying than a year ago, surely that is a positive outcome but again will it translate to a change in smoking-related behaviour? Behavioural economics theory suggests that people are more likely to react to a message if it is salient, i.e. if their attention is drawn to it. The health graphics on the new packaging have been changed to be more prominent and perhaps more salient but, interestingly, there was no difference in the thoughts about the harms of cigarettes between the two groups. Perhaps that is because they are already aware of the harms of smoking or perhaps because they have been exposed to many of these images so they are no longer novel and salient. This study is the one of the first to review the introduction of this new policy and provides some useful insights into the differences in attitudes between the two groups. In time, it will be interesting to see if these attitudes translate to a change in behaviour and reduction in smoking. Tags: #Policy, #Smoking, #Behavioural economics, #Behavioural psychology. William Trump - 29 Jul 2013, 5:07 p.m.
Behavioural Economics also tells us about "loss aversion" (that we really, really dislike losses) - and yet warnings on cigarette packets are always about health... never on the (prohibitive) cost. I would be interested to see the effect of messaging that emphasizes the cost of smoking. Something like a photo of a £5 note on the front of the packet of fags, saying "imagine what else you could be spending this £5 on?" Or: "for £5 you could be going to see a movie - and that's not bad for your health!" Alison McLean - 5 Aug 2013, 3:59 p.m.
What an interesting idea! The traditional approach to reducing smoking has been to increase the price through taxes in an attempt to reduce demand but I have not seen many strategies that consider how that message about cost is delivered. It would be really interesting to see if as you said framing the message as a "loss" has more of an impact. Jim L. - 17 Aug 2013, 5:29 p.m. Thanks for the post, interesting article indeed. My background is in consumer information processing and, in my opinion, we will not know the effects of plain-packaging cigarettes on quite-rates or usage intentions for some time still. The irony of plain-packaging cigarettes is that it is anything but plain—cigarette plain-packaging is weird. Behavioral research has found that we are likely to think of weird or abnormal things as harmful. For example, the normality of a product’s name has been found to affect the perceived harmfulness of a product. Products with weird names were perceived as more harmful than those with less weird names. The reason this was thought to be the case because we have a tendency to automatically infer greater risk from greater difficulty in information processing—with weird names being harder to process than normal names. 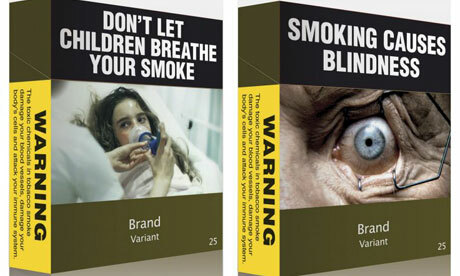 Such research, may forecast that plain (vs. less plain or standard) packaged cigarettes will be perceived as more harmful in the short term (when plain packaging is weird), but less harmful in the long run when the novelty of plain packaging wears off and they become, just as normal, but since they are plain, easier to process than standard cigarette packaging. Of course, this is an extrapolation of laboratory findings to the real-world, were many other factors will influence results. However, this line of thought elucidates the difficulty in knowing how nudge (or in this case, push) tactics will affect the overall welfare of the public in the long run. Alison McLean - 21 Aug 2013, 9:44 a.m. Thank you for your comment, your insights are very interesting. You mentioned that if we are presented with something that is difficult to process then we automatically infer greater risk. Does that mean if people are provided with lots of product information (for example a phone contract or similar) the harder the information is to process the more likely we are to perceive it as a risky purchase? Does that perception of risk also translate into perceived trust of a particular brand i.e. if one company provides information that is easier to process and that is perceived to be less risky, do people tend to trust them more? Jim L. - 22 Aug 2013, 12:47 a.m. The gist of your thinking is correct, there are numerous studies showing the effects of processing difficulty on judgment: all else being equal, more difficult to process = less truthful, intelligent (don't use big words), beautiful, safe, familiar, and the list goes on. However, the caveat of all this is that if the processing difficulty can be attributed to the processing itself (or something else not directly related to the judgment), then its effect on the target judgment is attenuated. In other words, if people realize that the product information is difficult to read, say because the font is really small, then the difficulty they experience will likely be attributed to the stimulus being processed and have little to no effect on subsequent judgement (e.g. is this a dangerous product). Howard Smith - 23 Aug 2013, 11:47 a.m.